READING - Reading senior Kevin Tobin was having a rotten day against BC High for much of the game. Tobin was called twice for not wearing his mouthpiece, and his offense sputtered as BC’s defense closed on him often. He took out his frustration on the sideline as the game went on, but in 20 seconds of overtime everything turned around. 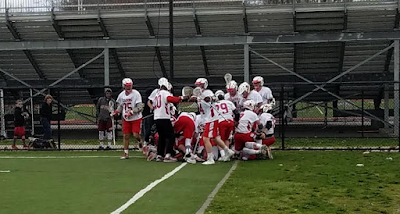 On a man advantage to start overtime, Tobin cut to the net, took a perfect pass from Ryan Melley and put it home to send the Rockets into a frenzy, and secure an 8-7 win over last year’s state runner-up. Tobin’s winner capped an all-around strong game from the Rockets. Reading and BC traded the lead in the first quarter, and the Rockets went into the half up 6-5. Reading got a good game from Jack Geiger. Geiger had a hat trick for the Rockets and freshman Michael Tobin added a pair of goals for Reading as well. Geiger’s third goal tied the game midway through the third quarter, and that’s how it stood until Kevin Tobin’s winner in OT. The Reading defense held BC High to 18 shots in the second half but only seven of them made it on cage. Rocket goalie CJ Hart turned aside nine shots in net, and the defense in front him kept BC to the outside and to low-percentage shots. After turning the ball over 23 times in a loss to Wakefield last week the Rockets locked it down on possession. Reading turned the ball over only six times compared to 11 by BC, and the Rockets won the groundball battle 20-12. Reading held BC scoreless for the final 21:10 of the game. The Eagles did get a solid three-goal, one-assist game from freshman Aidan Carroll. 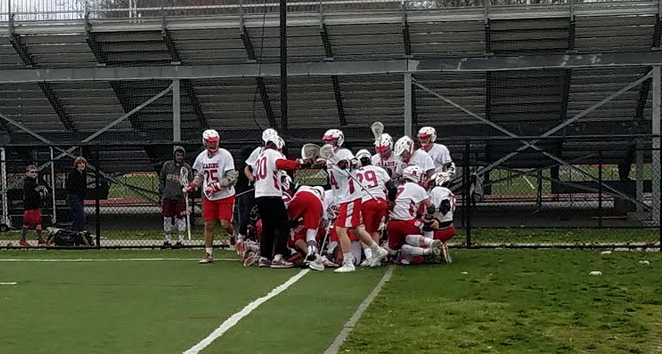 BC has now lost two in row, after the Eagles lost 11-5 to Rhode Island power La Salle Academy on Saturday, and must face Central Mass power St. John's Shrewsbury on Thursday. The Rockets will travel to Nashua to take on New Hampshire power Bishop Guertin on Thursday as well.